As of January 25th, the S&P 500 was up 6.3% year to date. Many S&P 500 2019 targets have already been surpassed in the first 3 weeks of the year. That’s while earnings estimates have cratered, and many economic reports have been delayed because of the government. We’ve already missed out on 2 durable goods orders reports. The government shutdown ended after 35 days. However, if there’s no agreement, the shutdown will resume on February 15th. That’s close to the March 2nd deadline for a trade deal with China. It’s safe to say political uncertainty is high. The table below shows the economic report backlog along with previous results and forecasted results. In the week of January 28th, 124 firms will be reporting earnings. The first 112 firms to report have had a sequential decline in EPS and sales growth as well as weak guidance which has pushed earnings estimates lower. As you can see from the chart below, Q4 EPS growth has fallen from 24.03% to 17.83% and sales growth has fallen from 7.16% to 6.03%. All periods are for the first 112 firms. As for estimate cuts, Q1 EPS growth is expected to only be 3.5% as of January 24th. That’s a decline of 5 basis points in one day and a decline from 5.54% at the start of the year. Somehow, earnings estimates collapsing by 2.54% and sparse economic data have helped stocks go on an incredible run. Furthermore, one of the reasons stocks have rallied this year took a hit this past week. Investors have been hoping for a trade deal, but Commerce Secretary Wilbur Ross stated the U.S. and China are “miles and miles” away from a trade deal. That’s after America canceled a trade meeting with China over a disagreement on intellectual property rights. 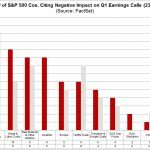 The good news is estimates for earnings growth are still positive and negative sentiment could be partially responsible for weak guidance and estimate declines. If earnings growth is in the low single digits, it doesn’t justify a bear market. Political uncertainty can easily change. Bullish investors would rather firms be cautious because of politics than be cautious because of weak demand. The final positive is low estimates could be beatable. Even if the economy was strong, high single digit earnings growth on top of amazing 2018 comps would be difficult to achieve. 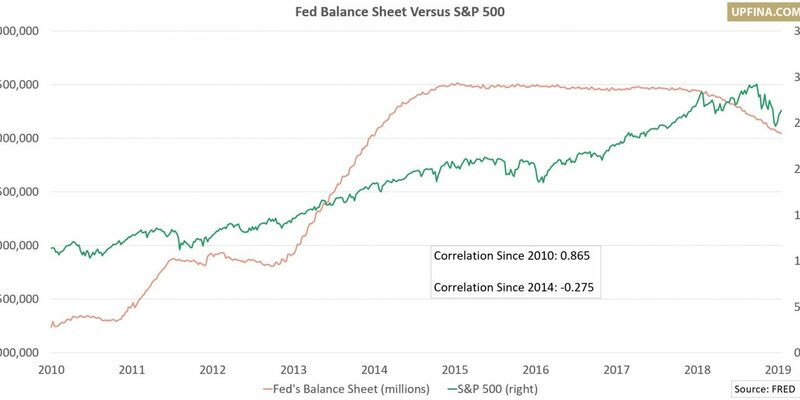 It will be interesting to see how much stocks continue to rally because while the Q4 2018 crash may have been overdone, there needs to be bullish economic reports for stocks to approach the previous records. The ECRI is a weekly leading index that is proprietary, so we don’t know what’s in it. It has a great track record of predicting economic slowdowns and corrections. ECRI states it is supposed to forecast cycle turning points 2-3 quarters in advance. The index has been improving for 3 straight weeks and the growth rate has improved for 2 straight weeks. The index was up 0.6 in the week of January 18th. The year over year growth rate increased from -6.2% to -5.3%. That’s impressive because the comps at the end of January are tough. This report still suggests growth will slow in the next 2-3 quarters. The good news is growth didn’t get as weak as it did during the previous 3 recessions. The more growth improves, the greater likelihood a recession isn’t coming in late 2019/early 2020. The leading indicators report is a monthly reading which has 10 known indicators. As the chart below shows, when it has negative year over year growth a recession usually follows. The Leading Economic Indicators (LEI) is still up 4.2% year-over-year. While there are a few instances where it has wrongly predicted a recession, think of the myriad of times it has correctly said a recession wasn’t coming when others have. 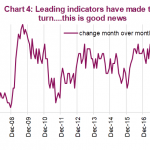 The leading indicators index was weak in December because the stock market cratered, and the ISM manufacturing index was weak. It should recover in January because stocks have rallied, and jobless claims have been very low. Year over year growth was 4.2%. The Conference Board stated this deceleration could mean GDP growth will decelerate to 2% by the end of 2019. 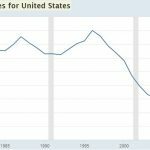 If many of the millennials that have delayed buying a house come back into the market and buy a house, creating a new household, demand for housing will increase dramatically. The Deutsche Bank chart below shows if the number of 16 or older people per household falls to where it was between 2000 and 2003 on average, almost 3 million new households would be created. Unfortunately, the “if” in that original statement is a big one. 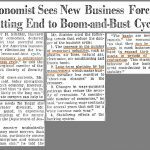 The business cycle is almost the longest one since the 1800s and the labor market is tightening. If millennials can’t create households now, when can they? The increase in the chart above might be secular. It’s difficult to move out and pay for rent for some millennials. Buying a house is quite the impossible leap. As the chart below shows rent’s increase as percentage of median income for 25-34 year olds has correlated with more millennials living at home. For an update on the housing market, we turn to D.R. Horton which is a homebuilder. The chairman stated, he observes some “moderation of demand for homes, particularly at higher price points.” That weakness could be related to the decline in the stock market. Keep in mind, this D.R. Horton report is from the last 3 months of 2018. The chart below shows the net contracts reported by the 9 major homebuilders compared to U.S. housing starts. The latest homebuilders’ reports signal another year over year decline for housing starts. The stock market has rallied significantly while earnings estimates have declined. Let’s see in the next few weeks if the economic reports justify this increase. The ECRI leading index and the leading indicators foresee a slowdown. However, the ECRI growth rate has improved recently. Some are looking for millennials to start buying houses. However, even though the labor market is strong, many millennials still can’t afford to move out and find an apartment.